We have managed to collect more portable sewing machines than we have cases to store and/or carry them in. We have been on lookout for carrying cases at a reasonable price. Elizabeth saw a case sitting by the road in the rain for trash pickup. 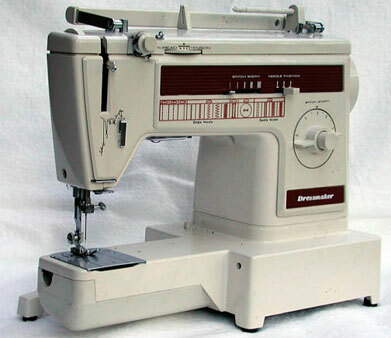 She snagged the case, but it fortunately/unfortunately contained a sewing machine--the Dressmaker 300Z pictured above. It was a very nice carrying case so the sewing machine didn't get wet. The Instruction manual was also in the case. The price was right on this one! It is missing an extension table that goes around the free arm. At quilt shows, we have seen several clear plastic extension tables designed just for this is purpose, but Jim can probably fabricate one from his stash of cherry. While the free arm might be nice for sewing shirt sleeves, we prefer a larger flat surface for quilting. In fact, we can't understand quilt maker's attraction of the Singer Featherweight free arm for this reason. The only thing we could find wrong with this machine (other than it being too new) is related to the thread spool holder. The holder contains a foam pad that applies a slight tension on the unwinding thread spools and that foam was totally deteriorated. A sewing machine repair service provided the necessary new foam pads for $3. The machine has built-in zig-zag and a very nice carrying handle. While the 300Z internals look a lot like our Singer 513, there is a whopping big difference in the needle thread tension mechanism. The needle thread tension discs are mounted on the top front. Threading the needle thread tension discs is not obvious, even with the aid of our instruction manual. Threading instructions are printed on the side of the machine. 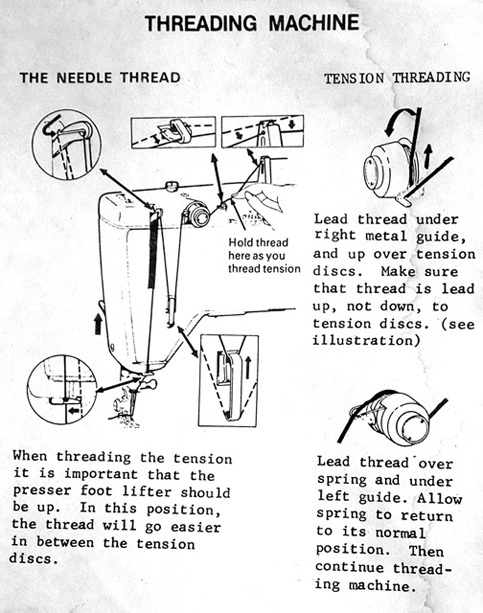 Threading of the bobbin winder also required reference to the instruction manual. The spooled thread crosses over itself in route to the bobbin. Once you figure it out, threading for sewing and bobbin winding becomes easier and faster. We don't know the age or value of this machine but judging from its condition we guess it is one of our latest machines.